baby shower | are you my moms? It has been an emotional day. Today my mother and our bff threw us one hell of a party, and our family (biological and chosen) simply showered us. We’ll never know how to thank the hostesses or the guests. I am writing this in part to give them as much public love as possible, and in part to hopefully stop myself from crying. We had asked to have a party – not a traditional baby shower. No silly shower games, no passing the gifts around, and to have it include all our friends and family of both genders. What we pictured was a simple brunch at a fabulous local restaurant – mimosas and bloody marys (and a special mocktail for me! ), great food, great company. What my mom and our lucky baby’s godmother gave us was so, so much more. A room of nearly 50 people gathered to wish us well. Along with all our local friends and family, MKL’s mother and a close family friend drove up from Florida in an amazing showing of love and support; my cousin and her husband packed up their still-tiny twins and made the 40 minute drive into the city, along with her mother who came in from Florida for the occasion; the minister who married us and his partner came in from an hour outside the city…all for us and our sweet little monkey. 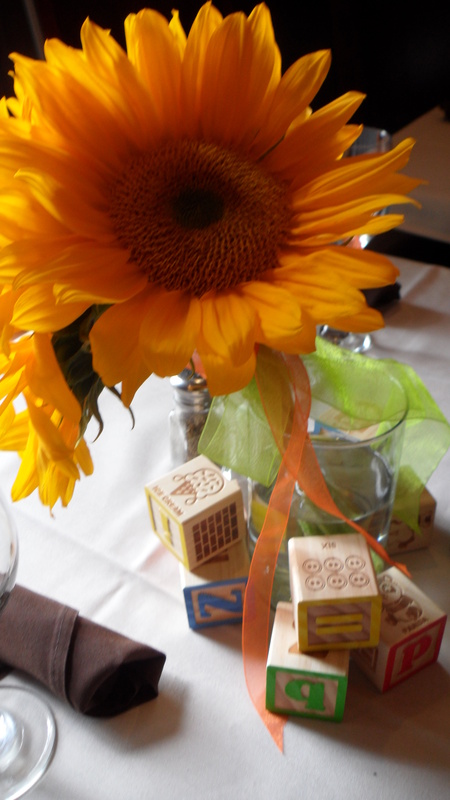 Our all-too-generous florist friend packed the room with gorgeous flowers in the colors of our nursery, along with blocks and stuffed animals as centerpieces. Guests were asked to add their stamp to a canvas in the colors of our nursery, creating a unique and truly special piece of custom artwork for the room. Pregnancy hormones are raging, as usual. I cry a lot these days. But I’m pretty sure that even if there were no baby in my womb right now, I’d have had a really hard time keeping my eyes dry. Everyone should experience what we got today. I wish everyone the opportunity to have their family (biological and chosen) show them how much they are loved. And I can promise that I will do my best to return their love at every turn from this moment on.